Once again many thanks to Eric Pemberton who sent me this article that was published by the Picture Post in 1939. In this fascinating article, it is important to remember that in the time before Television was widely available, people pursued numerous hobbies and interests. 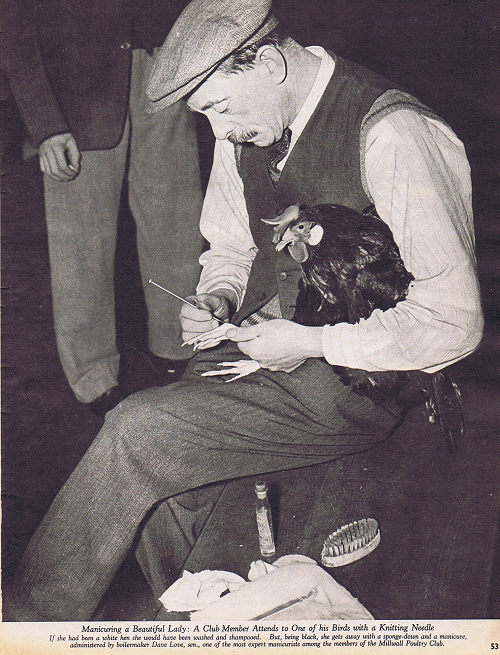 In the 1930s keeping Pigeons were very popular, however in Millwall it was obviously bigger birds that took their interest. A team of Pullets and trophies. Mr Dave Love Jnr plater,Mr C Sieloff labourer,Mr Dave Hedley lorry driver. Every Monday at Millwall,in the Isle of Dogs, forty men meet together for the evening. What brings them together in their interest in fowls –the way which poultry should be bred, housed and looked after. Towards eight o’clock every Monday evening in Millwall, a crowd of men can be seen making their way in twos and threes towards the L.C.C. Mens’s Evening Institute, in Glengall Grove. Under the arms of some there are small crates. Each of these crates contains a fowl; a sick fowl in this one, a particularly healthy and beautiful fowl in that. 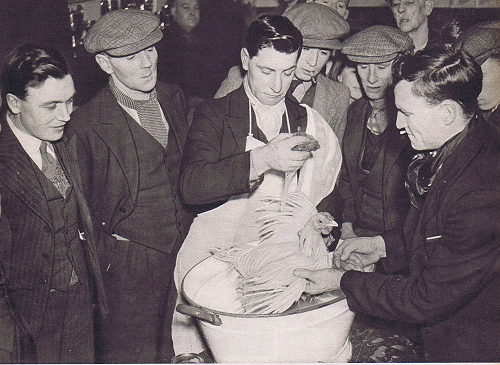 These men are all members of the Millwall Poultry Club. By profession they are dockworkers, lorry drivers, steeplejacks, metalworkers or casual labourers. On arrival at the Evening Institute they park their crates in the “classroom” and wait for the instructor to arrive. Some hold conversation with their fowls; others discuss the day’s news with their fellow members. As soon as the instructor appears, a piece of newspaper is spread over the desk in front of him, a sick bird belonging to one of the members is brought from the crate, and is stood up on the desk. The members then take it in turn to make their diagnosis. First , the new students express their opinion, then come the veterans, They examine the state of the bird’s eyes, they analyse its droppings. Their diagnosis may be that its condition is due to bad feeding or bad housing. Alternatively they may trace symptoms of some organic disease. When the members have had their say, the instructor sums up. 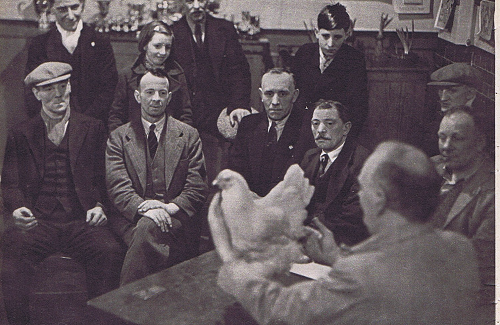 One of the most popular lecturers at these classes is Mr W. Powell-Owen, the president of the Club, who is an internationally known judge of poultry. Sometimes it is his duty to preside at an inquest on a fowl that has died. In that case the dead bird is opened up in the presence of the class of the class, who take it in turns to try and discover the inflammation or growth or other cause of death. This hobby of poultry breeding helps the members to increase their income and to make ends meet , apart from providing them with specialised interest and plenty of amusement. They keep their poultry in their backyards. They bring up their fowls to the Evening Institute to find out about their good and bad points. And how to feed, house and manage them. All members are taught to keep fowls which will lay eggs and yet be beautiful to look at. “Beauty with Usefulness” is the club’s motto. The sale of the eggs enables many a member to take its family for a holiday. The members are encouraged to exhibit their fowls at shows and to keep only the best grades. They send the birds all over England and even to the continent. Before the show, every bird with white plumage has to be washed and shampooed, every black coloured fowl has to be sponged and have its legs manicured. During the day, when their husbands are at work, the wives have to look after the poultry, and the instructor often makes the round to see whether all the chicks and hens are getting on all right. The club has been running for eleven years, and members pay as little as 5s. 6d per annum. There are some forty members – very much happier for having so useful a hobby. Each year the members have a country outing , in company with their wives. 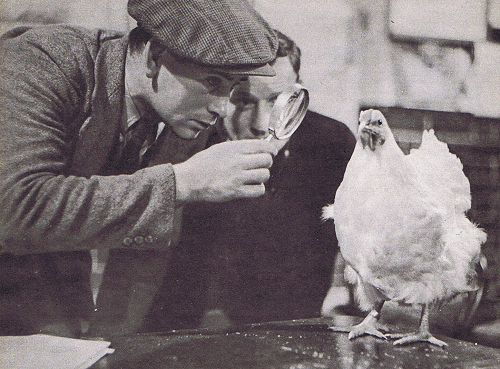 But even on this occasion the club members show themselves to be serious minded on the subject of fowls. The morning of this day is invariably spent in looking over some well known modern poultry farm. The rest of the day is given over to the usual activities of an annual outing. Although the” backyarders” of Millwall compete keenly with each other to rear the best birds, they are always willing to give each other help and advice between club nights , if a fellow members fowls happen to be ailing. One of the older members , Dave Hedley, has won so many prizes with his birds, that he decided to try rearing another breed, in which he had no experience , just to encourage the others. Dave Hedley says that his fowls play a valuable part in balancing of the household budget . With the cash which he gets from the sale of his eggs, he can buy silk stockings for his wife and his wife can buy all the household food. And even then there is something left over. 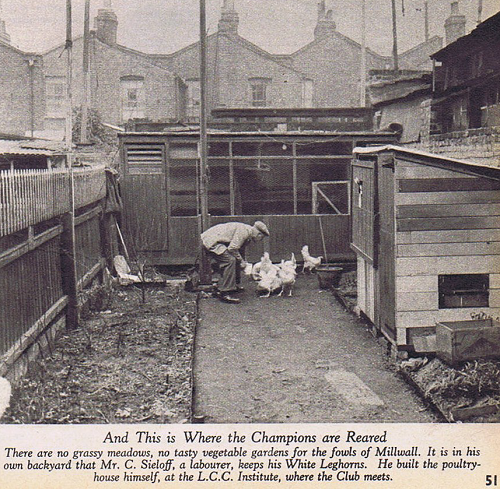 The Millwall Poultry Breeders have remarkable successes at poultry shows. They sent a strong team of pullets to this year’s International Show at Antwerp. 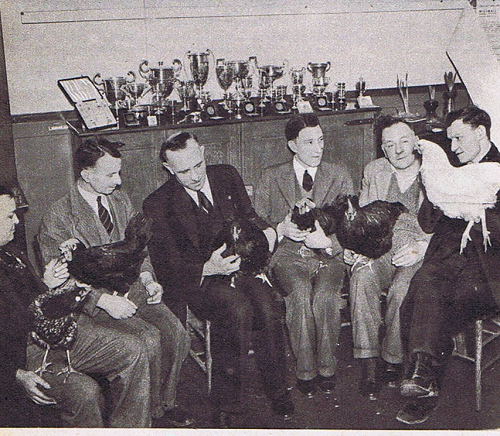 Each of their pullets won a prize, though unhappily , one of them , which many of the members believed to be the finest bird of the team, fell ill on the journey and died. By isleofdogslife in Human Life on April 5, 2013 .